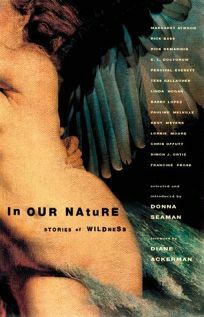 In a departure for DK Publishing, Booklist editor Donna Seaman collects 14 diverse and intriguing short works of fiction under the title Our Nature: Stories of Wildness. Contributors include popular nature writers like Linda Hogan and Diane Ackerman, who provides the foreword, and general fiction writers like Margaret Atwood, who suggests, fancifully, that she was a bat in a previous life. Recognizing that one need not write directly about nature to appreciate it, Rick Bass, Barry Lopez and E.L. Doctorow each explore how thin the line is that separates supposedly civilized beings from wild (or animalistic) behavior. With the freedom and expansiveness that fiction allows, each contributor shows how undeniably a part of nature we all are.